By GreenEyedLillies on December 24th, 2008 . Filed under: Contests, Decorating . Need some serious schooling in the art of the cupcake? The Cupcakes 101 Kit includes everything you need for a crash-course in cupcake decorating. Each kit includes baking cups, novelty toppers, and sprinkles. 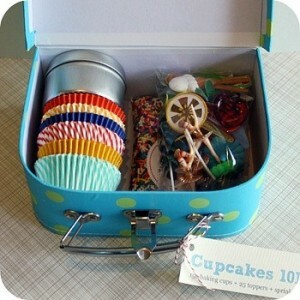 Everything is bundled up nicely in a small stitched suitcase to make a pretty sweet gift. *Approx. 150 standard baking cups in assorted striped and solid colors. *Wrapped and tagged in a small paperboard suitcase in pink with green polka dots. Do you LOVE it?! Wouldn’t it be SWEET to decorate some delicious Cupcakes with this?! Leave a Comment at The Cupcakes Club and it could be yours on 12/29/08 (only one comment please-we have to delete multiple comments to keep it fair) Also available for purchase at “Bake it Pretty“ website. I love Cupcakes and I would love to win this! This is too cute! We could surely whip up some cuties with this kit! Love your site too! Very Merry! Oh, love it! I did get some cupcake goodies for Christmas, but this would just kill me! I love your website! 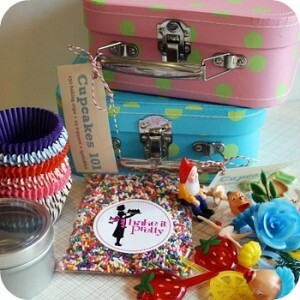 I’m so into cupcakes, this kit would be perfect for me to make some serious cupcakes with my nephews! This is such a cute item. I have just started to get into baking cupcakes. This is a very cute idea. I bake with my 4 year old niece all the time and she loves it. I would lovvvve to make them pretty as yours !